Students who’ve qualified as National Merit Semifinalists know what it takes to generate excellent academic work. 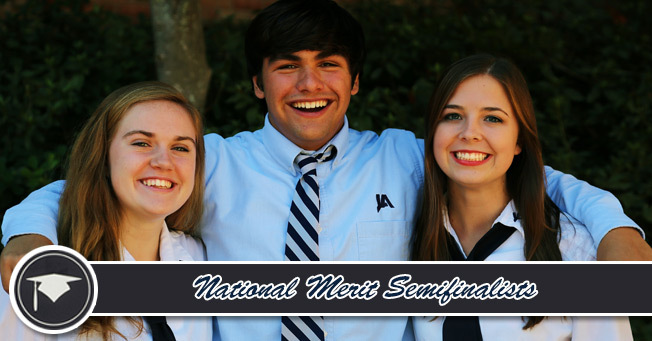 Yet along with high scores on the Preliminary SAT/National Merit Scholarship Qualifying Test, semifinalists at Jackson Academy show that an individual can be a scholar and a well-rounded person, too. Grace Golden, Andrew Hanebuth, and Ally Thigpen illustrate how commitment, preparation, and hard work combine with God-given abilities to produce success. For Grace Golden, the commitment sometimes begins as early as 5:00 a.m. On a big rivalry game week, the Accent officer can be found heading to campus before daylight to practice dance routines in preparation for the Friday pep rally and game performances. Practices are followed with work to boost school spirit, such as painting encouraging messages on the cars of football players. It is a job she loves and one that has been “a lot more work” than she anticipated. On the third rigorous day of Accent “two a days,” she still remembers to push her library chair up to the table and hold the door open for an adult as she departs the library. This polite demeanor appears second nature to Grace, even amid an academic schedule that includes Spanish IV, AP English literature, AP government, AP calculus, computer programming, and anatomy and physiology. Preparation is a trait that is natural to Andrew Hanebuth. 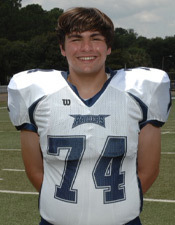 Describing himself as a “very science wired, history minded” individual, he balances his days among a slate of AP and honors classes, football, musicals, show choir, and quiz bowl. Outside of JA, he volunteers on his church video crew and camps once a month at Boy Scout gatherings. He not only prepared for this interview by considering the questions in advance, but in much larger ways he is thinking ahead to the kind of impact he wants to make on society. He has considered the future and has talked to enough people who’ve preceded him to know he’ll pursue a graduate-level degree immediately after completing an undergraduate degree in biochemistry. He is considering medical school or an advanced degree in biochemistry. Ally Thigpen understands the power of a strong work ethic. 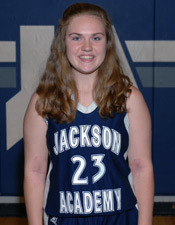 She completed a 5:45-7:15 a.m. basketball practice on a day of Advanced Placement tests. After school, she headed to Lemuria Books to work from 4:30 to 7:30 p.m. in a setting she absolutely loves. As the oldest in a family of five siblings, she’s had her share of first child responsibilities, so much so that her youngest brother once said “Yes, Ma’am” to her—a response she quickly nixed. She and her siblings all have regular chores. Like the other semifinalists, her success on the PSAT/NMSQT represents years of hard work. She doubled up on sciences in her sophomore and junior years so she could focus later on the classes she loved more. 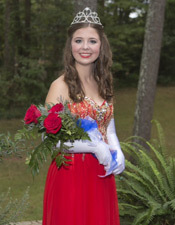 In her senior year, she enrolled in Latin IV, AP English literature, AP government, AP calculus, theatre, interactive media, plus Lady Raiders basketball. You may know her as…. “It’s so fun when I work out a (complex) problem and get the right answer, sometimes after having worked it three times. Also, the labs are fun.” (In this class, students travel to a nearby college to have lab in a college setting). You may know him as…. Which is you favorite class and why? What is the best advice you could give to JA students who are coming up behind you? How has your family encouraged your academic success? What do you hope to do in life? What career do you think you will choose? Since you work at a bookstore, what is your favorite book? Any final words of wisdom as a senior?